A section of a wall built in Solomon's day around 950 BC was found south of the Temple Mount on the Ophel. The remains of the excavated wall are 19.6 feet high and 230 feet long. Found along with the portion of Solomon’s wall were a gatehouse that led into the royal district of the city. The gate is built in the typical style used by Solomon and his builders at Megiddo, Beersheba and Ashdod, with four symmetrical rooms, two on each side of the passageway through the gate. 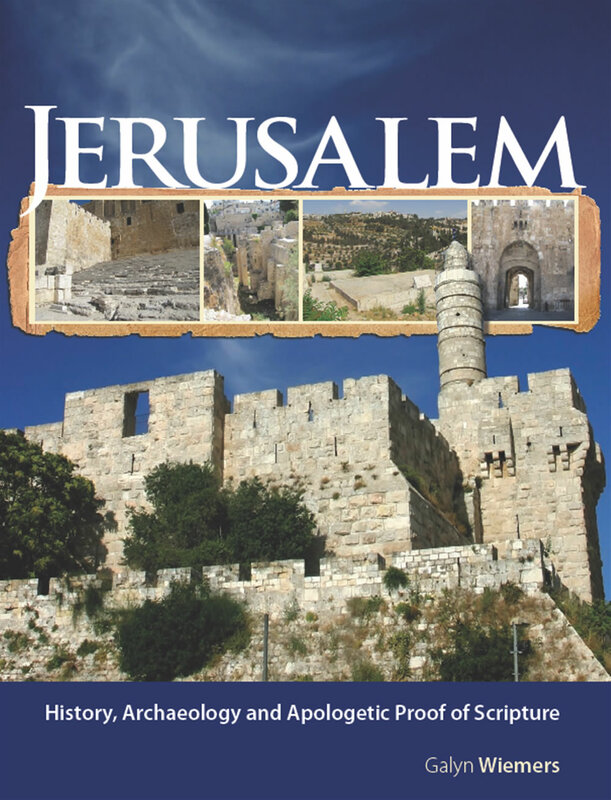 A 78 by 59 foot tower in the wall overlooking the Kidron Valley is located under the road that runs along the Ophel. Two earthenware jars, almost four feet tall, were also found from the time of Solomon. One jar handle was marked with the inscription: "For the King." King Solomon would have built his royal palace north of his father David’s palace further up the Ophel. This would later be called the “upper house of the king” by Nehemiah 3:25. The city wall would have been expanded north. This is that wall. 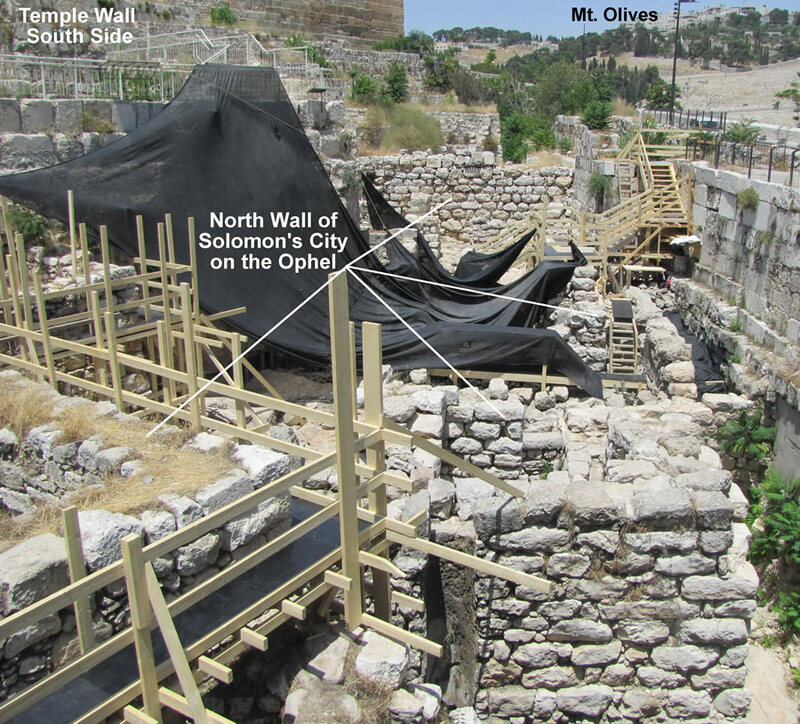 Walls built by Solomon north of David's Palace of Cedar (2 Samuel 5:11) and Solomon's Palace of the Forest of Lebanon (1 Kings 7:2), on the Ophel just south of the Temple Mount on Mount Moriah. He built the Palace of the Forest of Lebanon a hundredcubits long (150 feet), fifty wide (75 feet) and thirty high (45 feet), with four rows of cedar columns supporting trimmed cedar beams. It was roofed with cedar above the beams that rested on the columns—forty-five beams, fifteen to a row. Its windows were placed high in sets of three, facing each other. All the doorways had rectangular frames; they were in the front part in sets of three, facing each other. city on the Ophel. This is the wall recently excavated and seen in the photos. These are Solomon's walls built to extend the city to the north around his Palace of the Forest of Lebanon around the year 950. Solomon began to reign in 970.
gap in the north wall that was created by all of his construction work. These are the walls he built. Click image for a chart identifying the lettered sites.